Using a football movie clip as an introduction for a football preview may seem lazy, and it is, but I had a final today so forgive my laziness just this once. Besides, everything for this Akron team starts on defense, both strong and left side. It might be more appropriate to start with defense since I just said that’s where it all starts, but for consistency’s sake let’s look at the offense first. 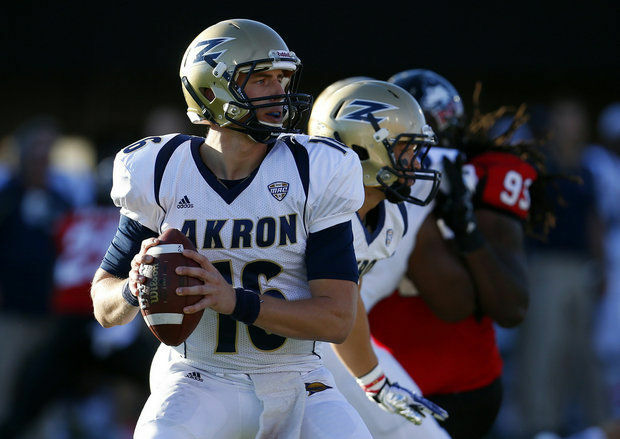 On both sides of the ball, transfers will comprise a large part of Akron’s production. This includes running back and potentially quarterback. 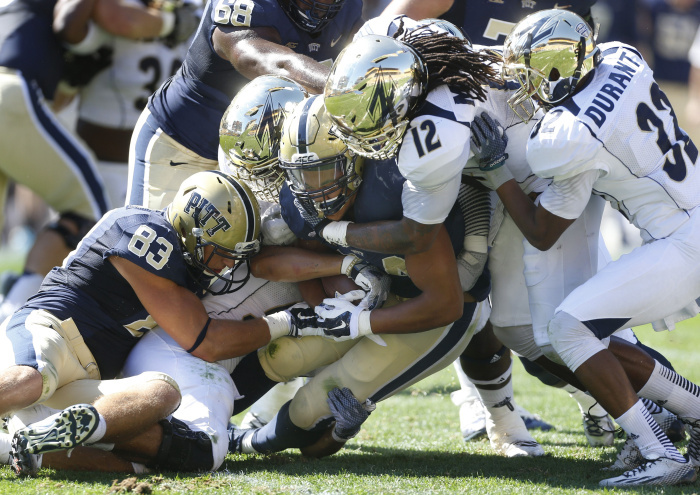 Kyle Pohl has the strongest arm in the conference, but shaky play and taking an astronomical 18 sacks last season may relegate him to second string with Pitt transfer and former four-star recruit Tra’von Chapman coming to town. As for running back, there is a hole to fill with Jawon Chisolm gone, but Colorado State transfer Donnell Alexander could be a worthy replacement. His efforts should be augmented by Chisolm’s backup from a season ago, Conor Hundley. Hundley topped 500 yards on the ground himself and punched in four scores. There is some turnover in the receiving corps also with Zach D’Orazio and L.T. Smith III gone, but Andrew Pratt, Imani Davis and Austin Wolf might even outshine their predecessors. (Is it just me or would Pratt, Davis and Wolf be an awesome name for a legal firm?) Their efforts ought to be aided by H-back Fransohn Bickley, who at 5’6 147 pounds is another example of the “big things in small packages” adage. One place you don’t want small packages is on the offensive line. Fortunately for Akron, they don’t. Akron returns four linemen who all weigh 295 pounds or more and a combined 58 starts. Stephen Erickson is the most likely bet to take over at center and he is listed at 6’2 305 pounds. Add that to three more 300-pounders on the two-deep and the Zips have plenty of beef up front. Jatavis Brown is nearly a unanimous selection for Preseason MAC Defensive Player of the Year. He’s also considered one of the top NFL prospects in the MAC with a translatable skillset. 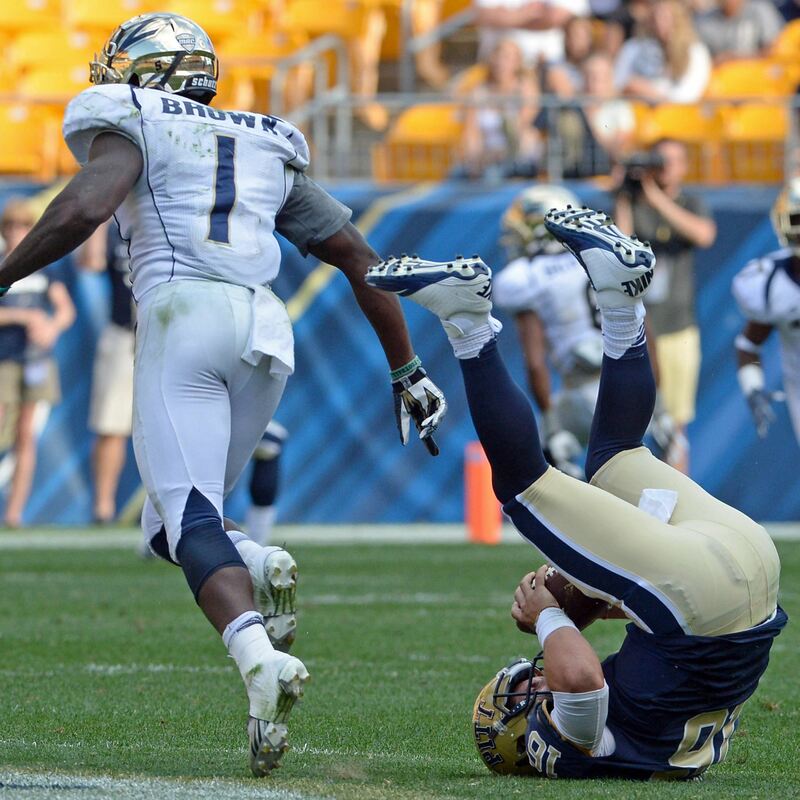 Brown racked up 14.5 tackles for loss and 4 sacks in 12 games last season to go with his 81.5 tackles. His chief running mate at linebacker will be Washington State transfer Darryl Monroe. The defensive line has a great mix of transfers and homegrown talent that combines to be the top D-Line in the conference, or close. Ohio State transfer Jamal Marcus is widely considered to be the Defensive Newcomer of the Year. Teaming him up with Preseason All-MAC NG Cody Grice, JUCO transfer and four-star recruit Se’Von Pittman, and Iowa State transfer Rodney Coe is almost unfair. Run on this defense at your own peril in 2015. The path of least resistance through this defense is through the air, and that might be a big problem for Akron. If you can keep your quarterback upright long enough to get a pass off, you will find greener pastures through the air. Cornerbacks Kris Givens and DeAndre Scott should be at least decent, but with the loss of their top four safeties from a season ago this defense may be susceptible to big passing plays. Projected starters Jerome Lane and Zach Guiser combined to break up or intercept a whopping zero pass attempts in 2014 despite both seeing playing time in every game. A step back for Akron would be a major disappointment in 2015, but the question marks on offense and safety negate a good defensive front seven. Plus, the non-conference schedule isn’t a breeze with trips to Oklahoma and UL-Lafayette and a home date with revenge-minded Pitt. The MAC schedule is manageable though so I may be undershooting the Zips a bit, especially if they can pull off road wins against Eastern Michigan and UMass and avoid any bad home losses.